What can you learn from the CES experience? The CE designation is a proof of education and experience necessary to competence. During the development of the Professional Designation Program, CES has adopted a list of 36 fundamental competencies that reflect the background, knowledge, skills, and dispositions program evaluators need to achieve standards that constitute sound evaluations. These competencies are grouped into five domains: reflective practice, technical practice, situational practice, management practice, and interpersonal practice. CES has developed an accompanying document of "descriptors" which provides additional detail on what each competency includes and means. A Credentialed Evaluator has proven, based on experience and/or education that they have mastery of at least 70% of the competencies in each of the five domains. A basic tenet of the CES Credentialed Evaluation designation is that both education and experience are necessary to reach minimum competence as an evaluator. 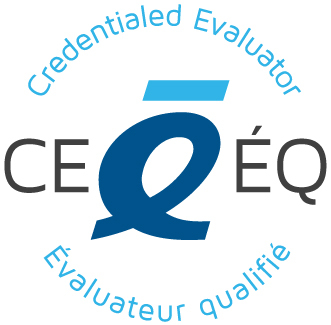 The CE designation is the only professional title identifying professional evaluators. The CE designation addresses a longstanding issue derived from the open nature of the evaluation field. As there are no restrictions on who may declare themselves evaluators, it became challenging for evaluators committed to upholding ethical and professional standards of evaluation to distinguish themselves, and for users of evaluation services to work with a referential tool that would allow them to better assess those evaluators they intend to hire or contract. The CE designation program addresses this gap and remains the only title identifying professional evaluators. PDP is founded on a solid conceptual base. The Canadian experience in developing the CE designation included initial research into designations generally and their use in recognizing, defining, and managing work within a profession. In extensive consultations, the merits, opportunities and threats of pursuing credentialing, certification or nothing at all, were debated prior to embarking on the road to developing the CE. There are three pillars supporting the CE designation: evaluators' behaviours (code of ethics); evaluation product (standards) and evaluator skills, knowledge and abilities (competencies) all provide a foundation for the CE designation. The criteria for the CE (experience, education and demonstrated mastery of 70% of competencies) was built with benefit of approaches in other professions, to assure accessibility to the profession, yet lay a minimal requirement for the recognition of what it takes to do competent evaluation work. It is a starting point for the CES, a voluntary program and service to its members which is envisioned to grow and mature – potentially towards more rigorous designation processes as our community and contextual environment matures. PDP is adaptable to national/regional exigencies. In developing the CE designation for Canada evaluation professionals, CES was cognizant of the global interdependencies within our field of practice. Crosswalks and comparisons of competencies and ethical codes of practice across jurisdictions were conducted while designing the Canadian model. The international evaluation community is maturing at different rates and paces in many regions of the world, some with increasing appetite for defining best practice within our work. While reflective of the Canadian reality, the principles and foundation of the PDP program could be adapted by other professional societies to mould them to their environment. PDP was successful because the professional environment was ready for it. The development and adoption (by CES) of the Professional Designations Program and its CE designation took place when a confluence of factors allowed this evolution. Evaluation was seen by some as under threat, from the growing use of value-for-money audit and profile or presence of the audit function more generally. Concurrently, research pointed to lower quality evaluation leading to less than optimal use and usefulness of evaluations. These negative pressures were balanced with the growing maturity and professionalism within the ranks of the Canadian evaluation community. Consultation of Canadian evaluation producers and users also indicated that there was a thirst for a mechanism to help identify competent evaluators. Underlying the PDP, and explicit in the project objectives, was a desire to come to consensus and define the parameters of what is an evaluator; how is an evaluator differentiated from other professions and what constitutes good evaluation.